Before :- S. Marimuthu, J. For the Petitioner :- P. Vijayabhanu, Advocate. For the Respondents :- Mr. K.T. Sankaran, Mr. G. Hariharan, Mr. M. Rajagopalan, Advocates and Public Prosecutor. S. Marimuthu, J. - Heard the learned Counsel appearing for the petitioner in Crl. M.C. No. 3570/97 and the learned counsel appearing for the additional respondent, namely, Sakkir Hussain and also the learned counsel appearing for the petitioner in Crl. M.C. No. 3408 of 1997. I examine the submissions of the learned Counsel as well as the papers available before me. Their arguments as well as the papers available would disclose that a Maruti car bearing No. MFC 8108 originally was owned by one Pushpa Raheja of Bombay who sold the same on 8.1.1997 to one Biju who is the petitioner in Crl. M.C. No. 3408 of 1997. Biju in turn sold the vehicle to one Sakkir Hussain who has been brought on record as additional respondent in both these petitions. Sakkir then sold the vehicle to one Joseph on 22.1.97. Thereafter, the vehicle was sold by Joseph to Moideen the petitioner in Crl. M.C. No. 3570 on 12.2.1997. As there arose some dispute between the vendors and purchasers with reference to the sale and purchase of the said vehicle, a complaint was given by Biju in Pavaratty Police Station wherein a case was registered in Crime No. 109/97 under Section 420 read with 34 IPC against Sakkir Hussain and Joseph. 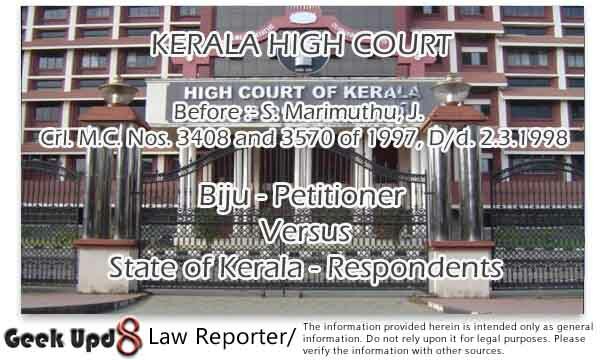 Moideen, the petitioner in Crl. M.C. No. 3570/97 also lodged a complaint before the Pattambi Police Station against Joseph his vendor under Section 420 IPC wherein a case was registered in Crime No. 191/97. Both the petitioners in the present criminal M.Cs, filed two petitions before the Judicial First Class Magistrate, Pattambi for the temporary custody of the said vehicle under Section 451 of the Crl.P.C. The learned Magistrate dismissed both the applications expressing his own reasons. Now questioning the above common order of the learned Magistrate, the present two Criminal Miscellaneous cases have been filed. 2. Now, the only point is whether the order passed by the learned Magistrate dismissing both the petitions is sustained in law. A vehicle like a Maruti car, needless to say, is more valuable. There is nothing on record to show that it is kept under a roof or in a shed, by the police. Therefore, when such a vehicle is parked in an open place exposing to sun and rain throughout the investigation, it will get damaged due to rain and sun. On account of it, the successful person as owner in this litigation will sustain a heavy loss. There is no undertaking, as borne out in records by the investigating agency who are in the custody of the vehicle that in case of damage being caused to the vehicle due to rain and sun they would compensate the real owner of the vehicle. That being the situation, I feel, as per the well settled principle of law, that the vehicle can be returned for temporary custody under Section 451 Cr.P.C. to the person from whom it was seized by the police. In this context, it is admitted by both the counsel as well as by the Public Prosecutor that the vehicle was seized by the investigating agency only from the petitioner in Crl. Misc. No. 3570/97. Therefore, the vehicle, for the present will be returned to the petitioner in Crl. M.C. No. 3570/97 for a temporary custody with the following conditions. The Maruti vehicle bearing No. MFC 8108 will be returned to the petitioner C.P. Moideen (Crl. M.C. No. 3570/97) on his executing a bond for a sum of Rs. one lakh with two sureties for the like amount to the satisfaction of the Magistrate. The petitioner Moideen is directed not to transfer the vehicle to anybody on any account until the Crl. prosecution is over. He will keep the vehicle in the same condition as it is now. He will produce the vehicle whenever required by the investigating agency for their investigation as well as he will produce before the Magistrate whenever the Magistrate requires. In the result, Crl. M.C. No. 3570/97 is disposed of as aforesaid. And Crl. M.C. No. 3508/97 stands dismissed.